Rolling out originally with the chevrons of Citroën on the front, the DS 3 had a revamp and refresh in 2016, now sitting pretty in the avant-garde livery of DS Automobiles (no Citroën badges to be seen). It sets the tone for the more established identity of DS Automobiles (the DS 5, DS 4 and DS 3 all get a more established identity, along with the original DS 7 Crossback), while Citroën heads in a different direction. The DS 3 has been something of a success, selling plenty of this small hatch in the UK in its former guise. In its new form, modern badge in tact, is this the avant-garde compact hatch of choice? A cursory glance at the new DS 3 reveals a familiar look. While there have been subtle changes to the exterior and interior, much of this car’s look now dates back to 2013. DS Automobile’s approach to keep the car exciting is through things like the limited edition Café Racer, harking back to motorbike chic of the 1960s. It’s a move to combat rival Mini, which is dripping in its own hipster take on the 1960s, pouring in Great British iconism, like Union Flag lights and racing stripes. 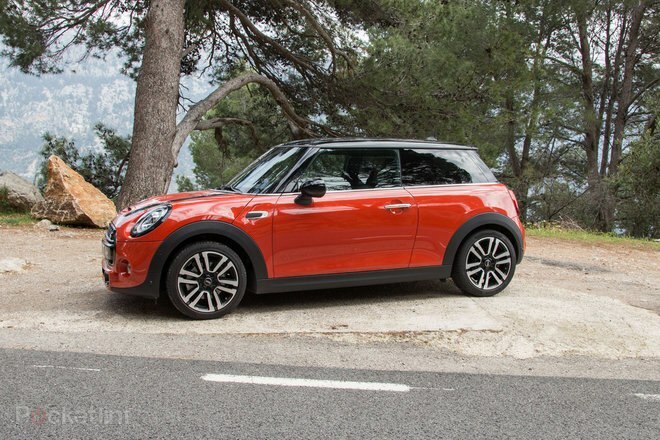 Judging by how many Minis you now see on the streets, it seems to be the brand with the advantage. 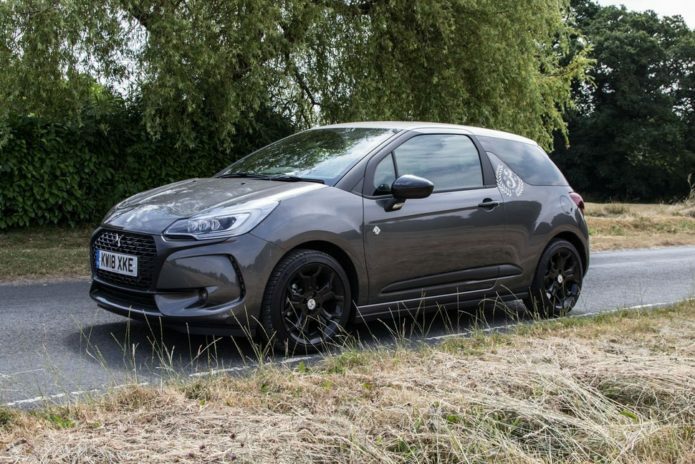 The DS 3 Café Racer is all about cool; it’s about speed and rebellion; it’s about throwing aside the conventional colouring of your car and giving you custom decals, including a full roof design. It’s certainly a head turner, so in many respects it’s done its job. Sitting on black alloys, deep tinted rear windows and custom badges, this is a good-looking car. The DS 3 is available in a wide range of options, but the Café Racer gives you four colours to choose from and limits some of the other options – although we like the balance of cream dash on the inside with the brown leather seats. It escapes the safe black-on-black that’s otherwise so common. If you want other options, the regular line-up of DS models will cater for you, but keep an eye on the prices as you make selections – limited editions work because you can’t always get that configuration through manual selection for the same price. There’s clear appeal elsewhere compared to the competition too: with slightly softer lines than the likes of the VW Polo, and slightly more space than the Mini Hatch, with a higher ride and larger boot, the DS 3 has a lot of appeal. 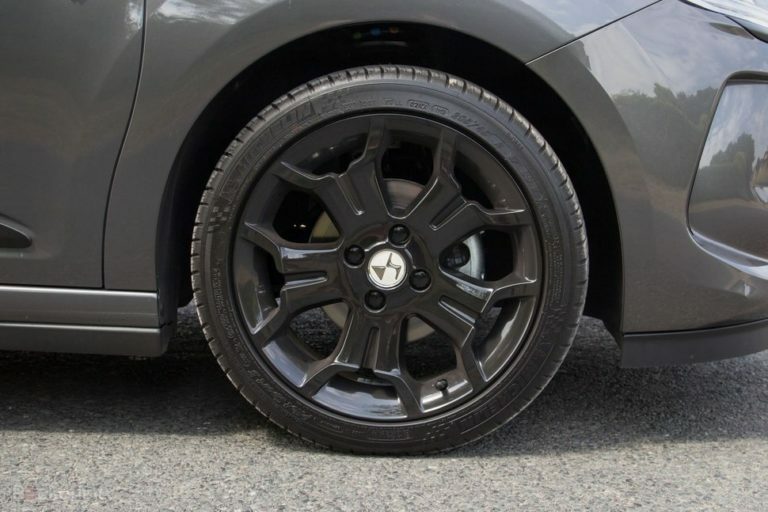 However, where you’ll find a slight dip in quality against something like the Mini or the Polo is when you shut the door and hear a bit of rattle (the mirror mount seem to shake on impact). We’ve always had a soft spot for the interior of the DS, marking itself aside from some of the compact cars of Citroën with more elegance. Much of the interior of this DS 3 reflects that of the previous model. The driver display is the same and the general layout is too, but now the 7-inch touchscreen is standard, dominating the central console. This has enabled DS to reduce clutter: there are 20 fewer buttons and controls than before, as more is handled through that central display. However, it does lead to that strange situation where there’s still a hole where the radio/CD player once sat – it’s neither deep enough to hold your phone or big enough to take anything else. The armrest also gets in the way of the handbrake, which is impractical in stop-start driving, although you can lift it out of the way. Then we have the touchscreen itself. This gives you modern features – including Apple CarPlay and MirrorLink for Android (the lack of Android Auto is a drawback) – but the absence of buttons isn’t necessarily a huge bonus. It’s a little tricky to navigate, and the menu button is a long way down, orphaned at the bottom of the centre stack with the volume controls. In reality, these controls should be up with the display. 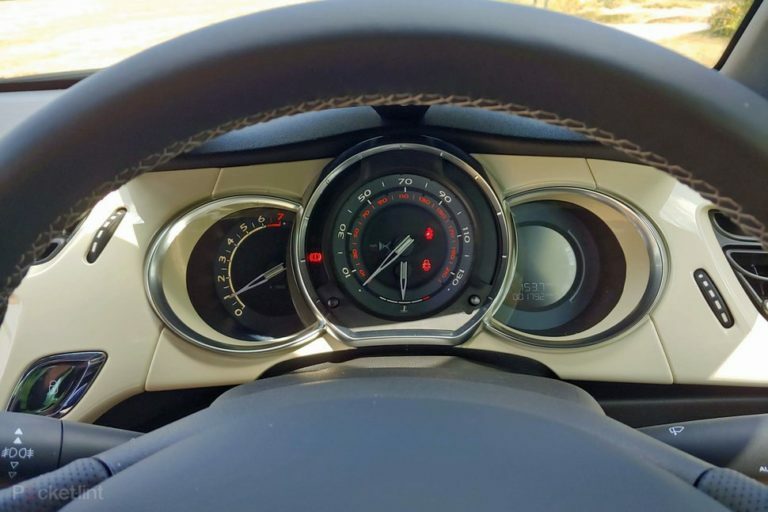 There are also no steering wheel controls, nor any crossover into the driver display, so it feels as though you spend a little too much time jabbing away at the screen and looking into the centre of the car, rather than being able to keep your eyes on the road. Keeping some of the interior on a completely different system imposes limitations in the DS 3 in a physical sense, but then the display isn’t hugely engaging and the user interface isn’t very modern either, so there’s plenty of room for improvement. Despite its apparent modernism, there’s a retro-fit feel to this car. The interior is light and airy thanks to the spread of the windows and the cream interior finish of this Café Racer edition. Plastics do dominate the cabin, though, even if some are textured and soft-touch finishes. Leather is widely used once you’re up to the Prestige level of the normal DS trims, with highlights and touch points of the Café Racer having a quality feel to them. The DS 3 is a compact car, sure, but there’s plenty of space for the driver and front passenger. The back seats are comfortable, but there’s not a huge amount of legroom, even if there’s plenty of headroom. If you have a long-legged driver, you’ll probably find it a bit of a squeeze in the back, but that’s a given for this size of car, unless you sacrifice boot space. There’s a lot of technology on offer through the trim levels too. The base Chic level gives air conditioning, an integrated air freshener, that 7-inch touchscreen, Bluetooth, USB, DAB radio and mood lighting. Stepping up to Elegance brings LED fog lights, sports pedals and plenty more, while the Prestige brings things like powered folding heated mirrors, LED Vision lights, sat nav, and active city break to stop you driving into the car in front when you’re not concentrating in busy traffic. The Café Racer gets the lot, along with a reversing camera, upgraded carpets and a whole lot more in an attractive extras package. There are some elements of the DS 3 that are really good. The seats are really comfortable, especially with the leather finishes and the unique “watchstrap” design. There’s plenty of adjustment in the steering column to get a comfortable position too. All trim levels get a leather steering wheel, which increases in quality as you step up the trim. The DS 3 is naturally set for a fairly sporty ride. With wheels starting at 16-inch and increasing to 17-inch on the Café Racer, you don’t lose that fun feeling when you’re on the road. Sports suspension comes on this model, too, which helps give a planted feeling that’s responsive, without body roll, but a little rough on rutted roads (the non-sports versions are better for those broken surfaces of British suburbia). There are a range of engine choices. We’ve driven the 130bhp and 165bhp petrol engines. There are diesel options for those more interested in economy (but not the environment). The Racer comes with the 130bhp manual setup. The exhaust note provides a sporty feeling too, as does the detailing of the rear splitter, sitting alongside the chrome exhaust pipes. It’s not in VW GTI contention, getting you from 0-62mph in 8.9 seconds, but it’s fun nonetheless, while remaining economical and averaging over 50mpg during our test times. 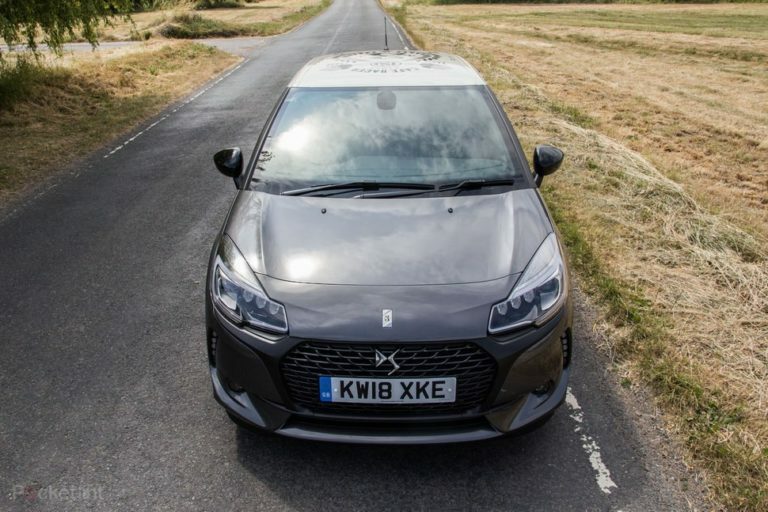 Emerging from its Citroën past and making an impact on this small hatchback segment, especially in the UK, the DS 3 has had a good run. 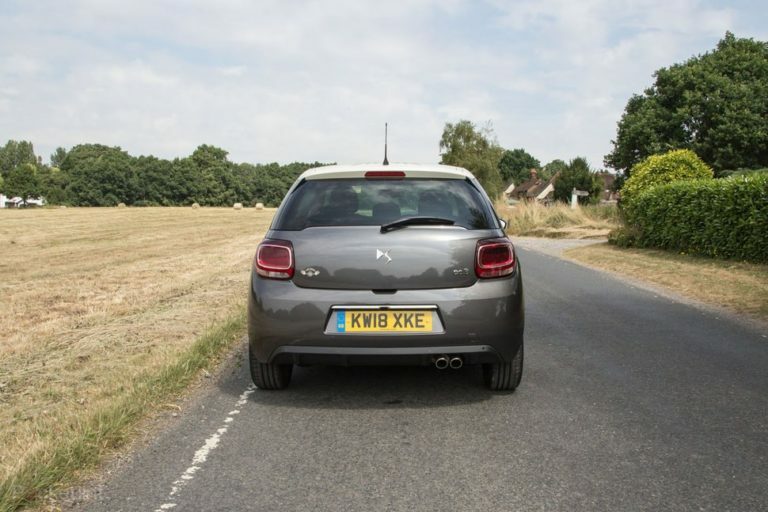 The planted, nippy and fun drive is what characterises the DS 3 and makes it an interesting car. It remains a car you’ll enjoy driving. That’s supported by petrols that are fun, a decent exhaust note without getting crass, and steering that feels engaged. Wrapped in the decals of this limited Café Racer edition there’s added appeal that you’re driving something unique. But, like an ageing rocker, there are some things that are a little out of tune. The infotainment system is dated and the layout of that centre console harks back five years ago when the tech was entirely different. It forges on, but it’s slightly off-beat. Sitting in the middle of the line-up, the Cooper Hatch can match the DS 3 Café Racer pretty much spec for spec, coming out at a similar price. Mini’s interior offers a little more flair, and while the tech has some of the same problems (no Android Auto, some questionable use of space), the Mini system offers a more engaging interface. 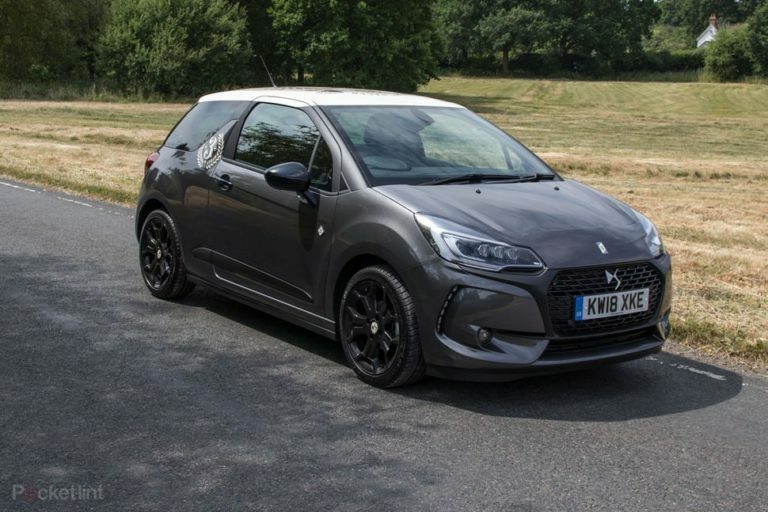 The DS 3 sits higher and rides higher than the Mini, so might appeal to urban drivers wanting more visibility, but no one quite matches Mini’s go-kart driving feel. 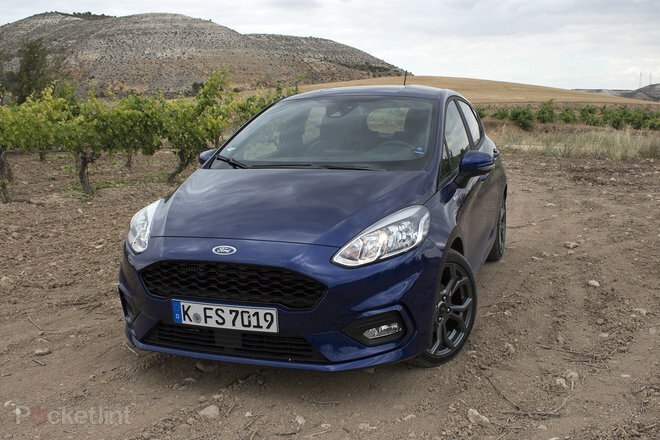 When it comes to small hatchbacks, it’s hard not to consider the Ford. 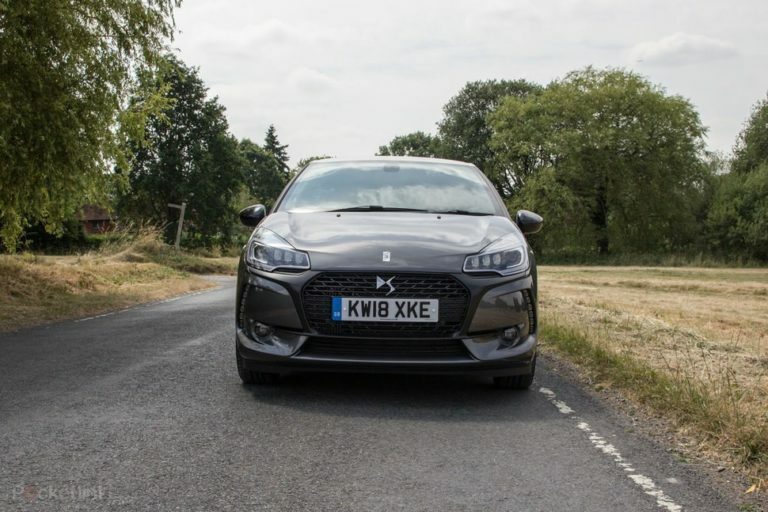 While the Fiesta is one of the most accomplished cars in the segment, it doesn’t have the exterior fair of some rivals – it’s a bit safe and boring. But the Fiesta ST, which you can get for around the same money as the DS 3 Café Racer, does add performance to that mixture, making it brilliant fun to drive.